← Time for a gamble? As part of my summer reading, I finished Paul Mason’s book “PostCapitalism: A Guide To Our Future” and although it’s an engaging read with many thoughtful insights, the concluding chapters on the future and policy implications were disappointing. Mason points to many of the same issues as Martin Wolf did in his book (see post) as reasons for our current situation, namely the inherent instability in allowing private profit seeking banks to create fiat money, ineffective regulation (and the impossibility of effective regulation), increased financialization, global flow imbalances, aging populations, climate change and the disruptive impact of new information technologies. This 2005 paper from Gretta Krippner on the financialization of the US economy and reports from S&P (here and here) on the policy implementations of aging demographics are interesting sources cited in the book. It is on the impact of the information technology and networks that Mason has the most interesting things to say. 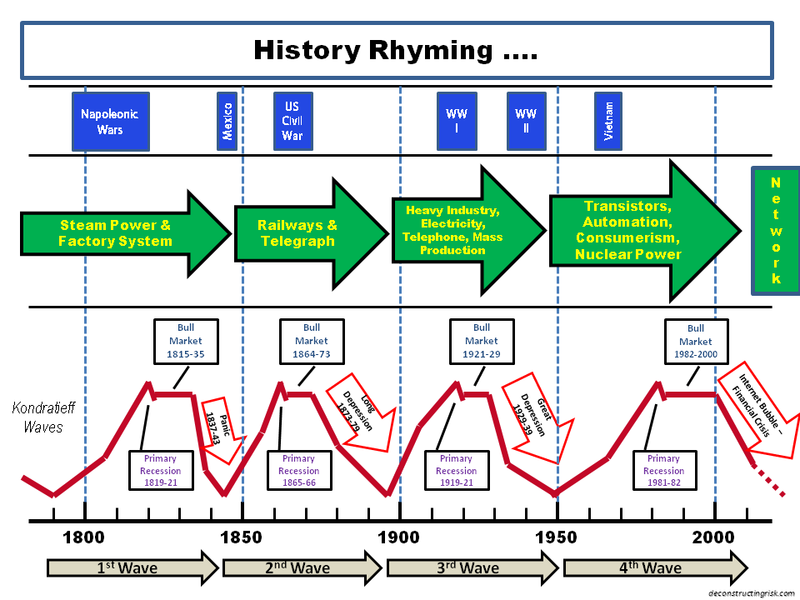 Mason uses Nikolai Kondratieff’s long wave theory on structural cycles of 50-60 years to frame the information technological age as the 5th wave. The graphic below tries to summarise one view of Kondratieff waves (and there are so many variations!) as per the book. The existence of such historical cycles are dismissed by many economists and historians, although this 2010 paper concludes there is a statistical justification in GDP data for the existence of such waves. Mason shows his left wing disposition in arguing that a little known theory from Karl Marx’s 1858 notebook called the Fragment on Machines gives an insight into the future. The driving force of production is knowledge, Marx theorises, which is social and therefore the future system will have to develop the intellectual power of the worker, enhancing what Marx referred to as the general intellect. Mason contends that the intelligent network we are seeing unfold today fits into Marx’s theory as a proxy for the general intellect. Mason also promotes the labour theory of value, as espoused by Marx and others, where automation is predicted to reduce the necessary labour in production and make work optional for many in a post-capitalist world. To highlight the relevance of this possibility, a 2013 study asserted that 47% of existing jobs in the US would be replaced by automation. References to Alexander Bogdanov’s sci-fi novel Red Star in 1909 may push the socialist utopia concept driven by the information age too far although Mason does give realistically harsh assessments of Soviet communism and other such misguided socialist experiments. The network effect was first discussed by Theodore Vail of Bell Telephone 100 years ago with Robert Metcalfe, the inventor of the Ethernet switch, claiming in 1980 that a network’s value is the number of users squared. Mason argues that the intelligent network, whereby every person and thing (through the internet of things) is wired to the network, could even reduce the marginal cost of energy and physical goods in the same way the internet has for digital products. Many of these ideas are also present in Jeremy Rifken’s 2014 book “Zero Marginal Cost Society”. Mason further argues that the network makes it possible to organise production in a decentralized and collaborative way, utilizing neither the market nor management hierarchy, and that info-capitalism has created a new agent of change in history: the educated and connected person. The weakest part of the book are the final chapters on possible policy responses which Mason calls Project Zero with the following aims: a zero carbon energy system, the production of products and services with near zero marginal costs, and the goal of pushing the necessary labour time close to zero for workers. Mason proposes a trial and error process using agent based modelling to be adopted by policy makers to test post-capitalism concepts. He refers to a Wiki-State, a state that acts like the business model of Wikipedia nurturing new economic forms without burdensome bureaucracies. Such a state should promote collaborative business models, suppress or socialize info-monopolies, end fractional banking (as per the Chicago Plan), and follow policies such as a minimum basic wage for all to accommodate the move to new ways of working. All very laudable but a bit too Red Star-ish for me! Nonetheless, Mason’s book has some interesting arguments that make his book worth the read. An aside – As highlighted above, there are many variations on the Kondratieff long wave out there. 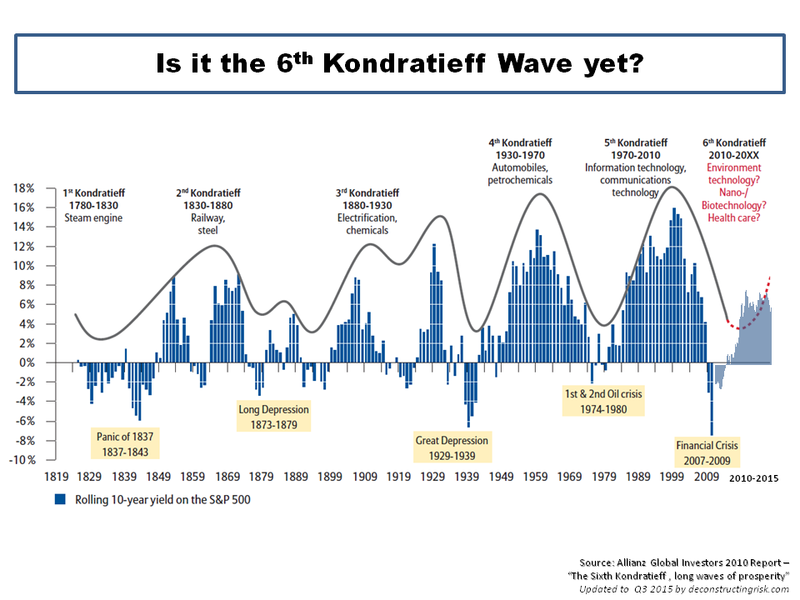 An interesting one is that included in a 2010 Allianz report which, using the 10 year average yield on the S&P500 as the determinant, asserts that we are actually entering the 6th Kondratieff wave (I have updated it to Q3 2015)! This entry was posted in Economics, Equity Market and tagged 10 year average yield S&P500, 6th Kondratieff wave, A guide to our future, agent based modelling, aging demographics, aging populations, Alexander Bogdanov, automation, Benoit Mandelbrot, burdensome bureaucracies, Chicago Plan, climate change, collaborative business models, collaborative production, fiat money, financialization, fractional banking, Fragment on Machines, general intellect, global flow imbalances, Gretta Krippner, ineffective regulation, info-capitalism, info-monopolies, information technologies, Intelligent Network, internet of things, Jeremy Rifken, Karl Marx, Kondratieff waves, Kondratiev cycle, Kondratiev wave, labour theory of value, long wave theory, management hierarchy, marginal cost, Martin Wolf, Nikolai Kondratieff, Paul Mason, post-capitalist world, Postcapitalism, private profit seeking banks, production is knowledge, Project Zero, Red Star, Robert Metcalfe, the network effect, Theodore Vail, Wiki-State, zero carbon energy system, Zero Marginal Cost Society, zero marginal costs. Bookmark the permalink.